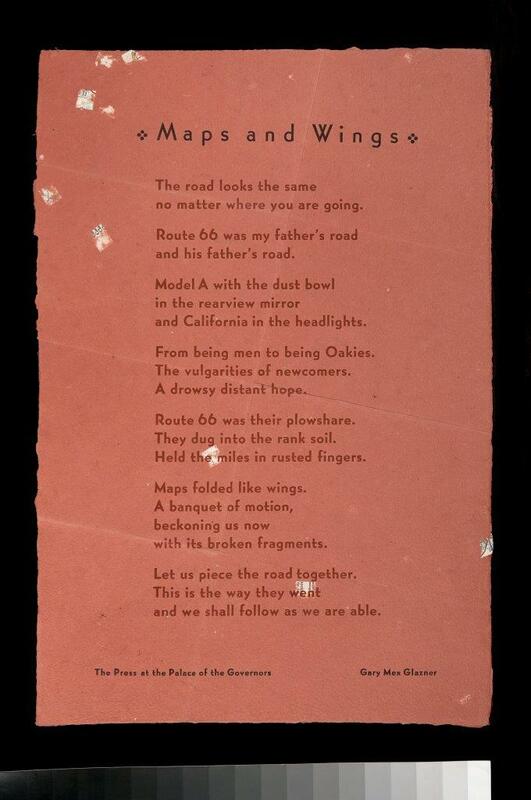 Historic Santa Fe Foundation (HSFF) celebrates National Poetry Month with an exhibit of more than 50 poetry broadsides and books by well-known and not-so-well known poets, all printed at the Press at the Palace of the Governors. The exhibition will open at HSFF’s El Zaguán, 545 Canyon Road, on Friday, April 5 from 5-7pm and continue through April 26, 2019. On Thursday, April 18 at 3pm, sit down with poets Joan Logghe, Renée Gregorio and John Brandi, along with Palace Press director Tom Leech for your daily dose of poetry and a conversation about the joys of slow reading and fine printing. Each of the poets has published several poems in the form of poetry broadsides and limited-edition books with the press. Reservations required for the Salon El Zaguán with the poets. To reserve a spot, visit the HSFF's Salon page. The Press at the Palace of the Governors, known informally as the Palace Press, introduces visitors to the world of 19th- and early 20th-century publishing. Located just off the museum courtyard, this former stable is home to a working exhibit dedicated to preserving and promoting New Mexico’s printing and literary traditions. A visit to the printshop recalls the time when each letter on a page passed through the hands of an artisan printer. Working in the tradition of such noted New Mexico presses as the Laughing Horse Press, the Seton Village Press and the Rydal Press, the Palace Press is the longest-running operation of its kind in the state and is today a center for contemporary book art activities. But printing has played an important role in New Mexico ever since its first press arrived at the Palace of the Governors via the Santa Fe Trail in 1834, when New Mexico was part of Mexico and its first imprints were published in Spanish. Though now lost to history, that legendary printing press, under the direction of Padre Antonio José Martínez, brought New Mexico into a new era. The modern incarnation of the Palace Press began in 1969 when the museum was offered the contents of the Estancia News-Herald print shop. Included was a platen press used in 1908 to print Jack Thorp’s Songs of the Cowboys, the world’s first publication of cowboy ballads. Posted on the walls are numerous handbills documenting the daily life of the Estancia Valley from the 1930s to the early 1950s, promoting everything from dances and basketball games to World War II black-out drills. Another permanent exhibit is the re-created studio of Gustave Baumann, New Mexico’s great 20th century artist-printer. Featured are Baumann’s press, watermarked papers, hand tools, and the pigments he used to make the ink for his masterful, color-saturated woodcut scenes of New Mexico and the Southwest. More historic presses fill the shop, and while each one has seen years of service in the noble art of printing, they all stand ready if called on to get out the news. For more information on the exhibition, contact Melanie McWhorter at 505-983-2567 or melanie@historicsantafe.org. Image shown here: Tom Leech, Director, Palace Press. Photo by Arthur Sze.